In the same spirit as Arthur Lewis’ famous quote that “there is nothing more practical than a good theory,” this paper provides a timeless, conceptual view on how mergers and acquisitions can create value for corporations and their stakeholders. The perspective taken is that of an operating company seeking to merge with or acquire another such company and gaining managerial and operational control of the combined entity. In particular, a number of scenarios on the relative size and industry focus of the two operating companies will be considered, and the key assumptions under which value will be created in the process explored. In this paper, corporate value is loosely defined as a longterm profit measure. It is assumed that companies acquire their production inputs at market prices. Some basic assumptions are that corporate managers work toward maximizing the long-term profit of a company, and that capital markets are efficient. The long-term profit measure of a company is intimately tied to its market value in the event of a merger or takeover. Companies have a range of options on how to use or distribute their profits (including as bonus payments to employees, and as dividends to shareholders). The Chapter “Overcoming the challenges and issues of post merger integration (PMI): Putting PMI in the driver’s seat in the M&A process! ” was written by Prof. Dr. Christopher Kummer. 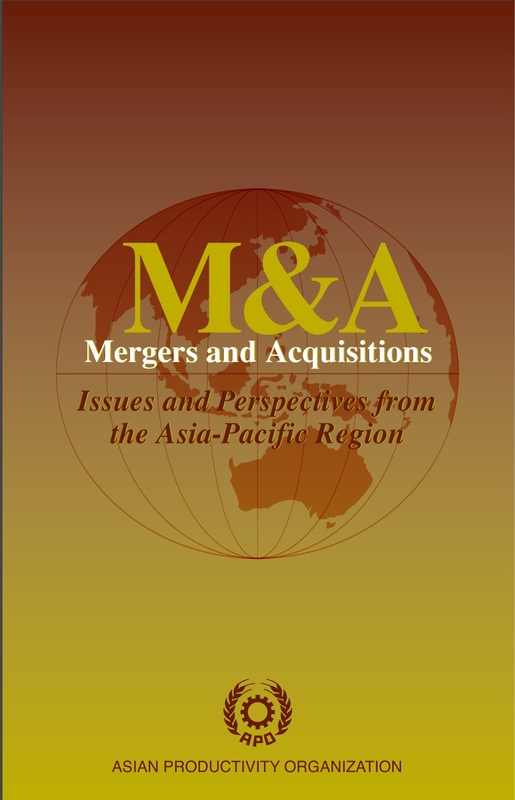 Asian Productivity Organization_Mergers and Acquisition – Issues and Perspectives from the Asia-Pacific.